We like to name things after people and places. 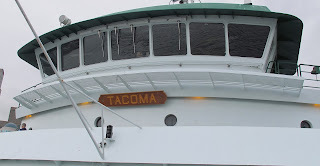 This ferry boat which took seventy plus garden bloggers from Seattle to Bainbridge Island last week is obviously named after a place, the city of Tacoma, Washington. A few days earlier, we all visited Dunn Gardens, named for the Dunn family members who originally created the gardens following a plan developed by the famous Olmsted Brothers landscape design firm in 1915. And now I've discovered that there is a lawn mower named after... ready for this? What a nice name for a mower! Thank you to Victoria of Victoria's Backyard for the honor, or as she wrote it, "honour". I learned of it through a comment on her blog. I don't usually have time to go back and read comments after I've left a comment, but this time I did. I must have been lead to do so by Dr. Hortfreud or maybe the garden fairies. Whoever, or whatever, drew me back to those comments, I'm glad they did. I hope "Carol" mows well and faithfully for Victoria for years to come, always with a sharp blade and a clean cut..
Now, what shall I name my three mowers? That is quite an honour, Carol. 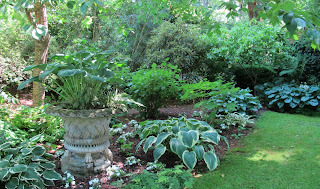 I believe the garden fairies led you back to read Victoria's response to your comment in which she revealed the naming. They may be garden fairies, but they know stuff that humans don't. hehe, that's such fun! And an honour! That is cute. I think I would like my mower better too if I named it Carol... :) Gives it a sense of friendliness. I call a lot of the dishes I cook a la Patrice - but that's because I don't follow recipes very well. And I don't think that counts if you name it yourself. Oh well. Love you Carol, bucking the no grass trend by having a lawn mower named after yourself. You got gusto baby!!!!! Compost... I have a responsible lawn and I mow responsibly! I won't apologize for having a lawn. All... still thinking about names for all my mowers. Purdue Pete for one, after where you got your degree. Sherry for the third, after your favorite sister! Alas! I cannot grow them in Lahore (zone10).